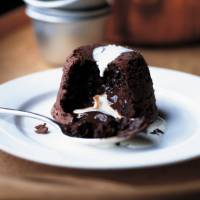 These delightfully sinful, hot, oozy chocolate puddings are the ultimate indulgence. Preheat the oven to 180°C, gas mark 4. Evenly brush individual metal pudding moulds (175ml) with butter. Evenly coat the buttered moulds with flour, tapping off any excess. Transfer the prepared moulds to a baking sheet. Place the chocolate and butter in a heatproof bowl set over a pan of barely simmering water, making sure the bowl does not touch the surface. Once melted, stir until smooth. Take the bowl off the pan to allow the chocolate to cool slightly. Place the eggs and sugar in a large mixing bowl. Using an electric whisk, beat on high for minutes or until very thick, pale and fluffy. Fold the cooled chocolate mixture into the eggs and sugar. Sift in the flour and gently fold it in. Divide the mixture equally between the prepared pudding moulds. Place in the oven for 14-16 minutes. Remove from the oven and set aside for 2 minutes. Using a tea towel, invert onto plates and carefully remove the moulds. Serve immediately with a scoop of vanilla ice cream or a good glug of double cream. The pudding moulds can be buttered and floured up to a day ahead and then refrigerated until needed.